"A340" redirects here. For the road in Hampshire and Berkshire, see A340 road. The Airbus A340 is a long-range, four-engine, wide-body commercial passenger jet airliner developed and produced by the European aerospace company Airbus. The A340 was assembled at Toulouse, France. It seats up to 375 passengers in the standard variants and 440 in the stretched -600 series. Depending on the model, it has a range of between 6,700 to 9,000 nautical miles (12,400 to 16,700 km; 7,700 to 10,400 mi). Its distinguishing features are four high-bypass turbofan engines and three-bogie main landing gears. The A340 was manufactured in four fuselage lengths. The initial variant, A340-300, which entered service in 1993, measured 63.69 metres (209.0 ft). The shorter -200 was developed next, and the A340-600 was a 15.96 metres (52.4 ft) stretch of the -200. The -600 was developed alongside the shorter A340-500, which would become the longest-range commercial airliner until the arrival of the Boeing 777-200LR. The -200 and -300 models were powered by the 151 kilonewtons (34,000 lbf) CFM56-5C, while the 267-kilonewton (60,000 lbf) Rolls-Royce Trent 500 was the exclusive powerplant for the extended-range -500 and -600 models. The initial A340-200 and -300 variants share the fuselage and wing of the twin-engine Airbus A330 with which it was concurrently designed. The heavier A340-500 and -600 are longer and have larger wings. Launch customers Lufthansa and Air France placed the A340 into service in March 1993. In September 2011, 379 orders had been placed (not including private operators), of which 375 were delivered. The most common type were the A340-300 model, with 218 aircraft delivered. 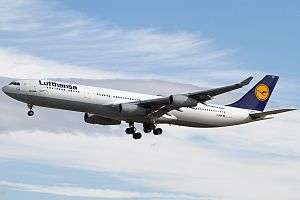 Lufthansa is the biggest operator of the A340, having acquired 59 aircraft. The A340 is used on long-haul, trans-oceanic routes due to its immunity from ETOPS restrictions; however, with reliability and fuel efficiency in engines improving, airlines have gradually phased out the type in favour of the more economical Boeing 777 twinjet, while Airbus has positioned the larger variants of the Airbus A350 as a successor. Airbus announced on 10 November 2011 that A340 production had been concluded. When Airbus designed the Airbus A300 during the 1970s, it envisioned a broad family of airliners to compete against Boeing and Douglas, two established US aerospace manufacturers. From the moment of formation, Airbus had begun studies into derivatives of the Airbus A300B in support of this long-term goal. Prior to the service introduction of the first Airbus airliners, Airbus had identified nine possible variations of the A300 known as A300B1 to B9. A 10th variation, conceived in 1973, later the first to be constructed, was designated the A300B10. It was a smaller aircraft that would be developed into the long-range Airbus A310. Airbus then focused its efforts on the single-aisle market, which resulted in the Airbus A320 family, which was the first digital fly-by-wire commercial aircraft. The decision to work on the A320, instead of a four-engine aircraft proposed by the Germans, created divisions within Airbus. As the SA or "single aisle" studies (which later became the successful Airbus A320) underwent development to challenge the successful Boeing 737 and Douglas DC-9 in the single-aisle, narrow-body airliner market, Airbus turned its focus back to the wide-body aircraft market. The A300B11, a derivative of the A310, was designed upon the availability of "ten ton" engines. It would seat between 180 and 200 passengers, and have a range of 6,000 nautical miles (11,000 km). It was deemed the replacement for the less-efficient Boeing 707s and Douglas DC-8s still in service. The A300B11 was joined by another design, the A300B9, which was a larger derivative of the A300. The B9 was developed by Airbus from the early 1970s at a slow pace until the early 1980s. It was essentially a stretched A300 with the same wing, coupled with the most powerful turbofan engine at the time. It was targeted at the growing demand for high-capacity, medium-range, transcontinental trunk routes. The B9 would offer the same range and payload as the McDonnell Douglas DC-10, but would use between 25% to 38% less fuel. The B9 was therefore considered the replacement for the DC-10 and the Lockheed L-1011 Tristar. North American operators were clearly in favour of a twin[jet], while Asians wanted a quad[jet]. In Europe, opinion was split between the two. The majority of potential customers were in favour of a quad despite the fact, in certain conditions, it is more costly to operate than a twin. They liked that it could be ferried with one engine out, and could fly 'anywhere'— ETOPS (extend-range twin-engine operations) hadn't begun then. The first specifications of the TA9 and TA11 were released in 1982. While the TA9 had a range of 3,300 nautical miles (6,100 km), the TA11 range was up to 6,830 nautical miles (12,650 km). At the same time, Airbus also sketched the TA12, a twin-engine derivative of the TA11, which was optimised for flights of a 2,000 nautical miles (3,700 km) lesser range. By the time of the Paris Air Show in June 1985, more refinements had been made to the TA9 and TA11, including the adoption of the A320 flight deck, fly-by-wire (FBW) flight control system and side-stick control. Adopting a common cockpit across the new Airbus series allowed operators to make significant cost savings; flight crews would be able to transition from one to another after one week of training. The TA11 and TA12 would use the front and rear fuselage sections of the A310. Components were modular and also interchangeable with other Airbus aircraft where possible to reduce production, maintenance and operating costs. Airbus briefly considered a variable camber wing; the concept was that the wing could change its profile to produce the optimum shape for a given phase of flight. Studies were carried out by British Aerospace (BAe) at Hatfield and Bristol. Airbus estimated this would yield a 2% improvement in aerodynamic efficiency. However, the plan was later abandoned on grounds of cost and difficulty of development. Airbus had held discussions with McDonnell Douglas to jointly produce the aircraft, which would have been designated as the AM 300. This aeroplane would have combined the wing of the A330 with the fuselage of the McDonnell Douglas MD-11. However, talks were terminated as McDonnell Douglas insisted on the continuation of its trijet heritage. Although from the start it was intended for the A340 would be powered by four CFM56-5 turbofan engines, each capable of 25,000 pounds-force (110 kN), Airbus had also considered developing the aircraft as a trijet due to the limited power of engines available at the time, namely the Rolls-Royce RB211-535 and Pratt & Whitney JT10D-232. On 27 January 1986, the Airbus Industrie Supervisory Board held a meeting in Munich, West Germany, after which board-chairman Franz Josef Strauß released a statement, "Airbus Industrie is now in a position to finalise the detailed technical definition of the TA9, which is now officially designated the A330, and the TA11, now called the A340, with potential launch customer airlines, and to discuss with them the terms and conditions for launch commitments". The designations were originally reversed because the airlines believed it illogical for a two-engine jet airliner to have a "4" in its name, whilst a quad-jet would not. On 12 May 1986, Airbus dispatched fresh sale proposals to five prospective airlines including Lufthansa and Swissair. In preparations for production of the A330/A340, Airbus's partners invested heavily in new facilities. Filton was the site of BAE's £7 million investment in a three-storey technical centre with an extra 15,000 square metres (160,000 sq ft) of floor area. BAe also spent £5 million expanding the Chester wing production plant by 14,000 m2 (150,000 sq ft) to accommodate a new production line. However, France saw the biggest changes with Aérospatiale starting construction of a new Fr.2.5 billion ($411 million) assembly plant, adjacent to Toulouse-Blagnac Airport, in Colomiers. By November 1988, the first 21 m (69 ft) pillars were erected for the new Clément Ader assembly hall. The assembly process, meanwhile, would feature increased automation with holes for the wing-fuselage mating process drilled by eight robots. The use of automation for this particular process saved Airbus 20% on labour costs and 5% on time. British Aerospace accepted £450 million funding from the UK government, short of the £750 million originally requested. Funds from the French and German governments followed thereafter. Airbus also issued subcontracts to companies in Austria, Australia, Canada, China, Greece, Italy, India, Japan, South Korea, Portugal, the United States, and the former Yugoslavia. The A330 and A340 programmes were jointly launched on 5 June 1987, just prior to the Paris Air Show. The order book then stood at 130 aircraft from 10 customers, apart from the above-mentioned Lufthansa and International Lease Finance Corporation (ILFC). Eighty-nine of the total orders were A340 models. Over at McDonnell Douglas, ongoing tests of the MD-11 revealed a significant shortfall in the aircraft's performance. An important carrier, Singapore Airlines (SIA), required a fully laden aircraft that could fly from Singapore to Paris, against strong headwinds during mid-winter in the northern hemisphere. The MD-11, according to test results, would experience fuel starvation over the Balkans. Due to the less-than-expected performance figures, SIA cancelled its 20-aircraft MD-11 order on 2 August 1991, and ordered 20 A340-300s instead. The MD-11 failed commercially and unsuccessfully competed with the A340. The first flight of the A340 occurred on 21 October 1991, marking the start of a 2,000-hour test flight programme involving six aircraft. From the start, engineers noticed that the wings were not strong enough to carry the outboard engines at cruising speed without warping and fluttering. To alleviate this, an underwing bulge called a plastron was developed to correct airflow problems around the engine pylons and to add stiffness. European JAA certification was obtained on 22 December 1992; FAA followed on 27 May 1993. Airbus delivered the first A340, a -200, to Lufthansa on 2 February 1993. The 228-seat A340-200, named Nürnberg, entered service on 15 March. The A340s were intended to replace aging DC-10s on the airline's Frankfurt–New York services. Meanwhile, Air France took its first A340-300 on 26 February, the first of nine it planned to operate by the end of the year. The A340 replaced the Boeing 747s on Paris–Washington D.C., flying four times weekly. Coincidentally, the first Air France A340 was the 1000th Airbus aircraft to leave the Toulouse facility since the consortium's beginning. During the Paris Air Show, on 16 June 1993 an A340-200 named The World Ranger took off for a round-the-world demonstration and publicity-stunt flight. The aircraft, carrying 22 persons, had been modified for the flight, including the addition of five center tanks. Taking off at 11:58 local time, The World Ranger made only one stop en route – in Auckland, New Zealand – and arrived back in Paris 48 hours and 22 minutes later, at 12:20. The flight broke six world records at the time. Among the six was the longest non-stop flight by an airliner, when the aircraft flew 19,277 kilometres (10,409 nmi) from Paris, arriving in Auckland in record time. The A340 would hold this record for a total of 12 years; in 2005, a Boeing 777-200LR flew from Hong Kong eastward toward London, successfully completing a 21,602 kilometres (11,664 nmi) journey. During the 1990s, the A340-300 was challenged by the more fuel-efficient Boeing 777-200ER twinjet. In addition, airlines were looking for replacement aircraft for their 1970s-era Boeing 747-100s and -200s, so Airbus investigated a stretched airframe in the form of the A340-400X. This proved unpopular, as the CFM56 engines were at the limits of their growth capability and the range would have decreased to around 10,000 km (5,400 nmi). A new plan to develop an A340 variant with a larger wing and engine combination was decided upon. Pratt & Whitney, Rolls-Royce and General Electric competed to be selected as the supplier of the new engine to power the type; talks between General Electric and Airbus over an exclusive engine arrangement collapsed in 1997 following disagreement over cost and risk-sharing. Airbus ultimately decided to adopt a variant of the Rolls-Royce Trent engine series, which was viewed as cost-effective as it did not involve developing an independent power plant. In April 1996, Airbus announced that it would offer a stretched variant of the aircraft, designated as the A340-600. The A340-500/600 would be developed as ultra-long range (ULR) aircraft. Despite the introduction of the A340-500 and A340-600, sales slowed in the 2000s, respectively as the Boeing 777-200LR and -300ER dominated the long-range 300-400 seating sector. The subsequent announcement of high gross weight variants, the A340-500IGW and A340-600HGW, did not arouse much sales interest. Airbus confirmed in January 2006 that it had conducted studies into developing an A340-600E (Enhanced). Airbus projected that it would be more fuel-efficient than earlier A340s, closing the 8–9% disparity with the Boeing 777 via the use of the new Trent 1500 engine as well as technologies derived from the A350 programme. In 2007, Airbus predicted that another 127 A340 aircraft would likely be produced through 2016, the projected end of production. On 10 November 2011, Airbus announced the end of the A340 program. At that time, the company indicated that all firm orders had been delivered. The decision to terminate the program came as A340-500/600 orders came to a halt, with analyst Nick Cunningham pointing out that the A340 "was too heavy and there was a big fuel burn gap between the A340 and Boeing’s 777". Bertrand Grabowski, managing director of aircraft financier DVB Bank SE, noted "in an environment where the fuel price is high, the A340 has had no chance to compete against similar twin engines, and the current lease rates and values of this aircraft reflect the deep resistance of any airlines to continue operating it”. Airbus has positioned the larger versions of the A350, specifically the A350-900 and A350-1000, as the successors to the A340-500 and A340-600. As a sales incentive amid low customer demand during the Great Recession, Airbus had offered buy-back guarantees to airlines that chose to procure the A340. By 2013, the resale value of an A340 declined by 30% over ten years, and both Airbus and Rolls-Royce were incurring related charges amounting to hundreds of millions of euros. Some analysts have expected the price of a flight-worthy, CFM56-powered A340 to drop below $10 million by 2023. As an effort to support the A340's resale value, Airbus has proposed reconfiguring the aircraft's interior for a single class of 475 seats. As the Trent 500 engines are half the maintenance cost of the A340, Rolls-Royce proposed a cost-reducing maintenance plan similar to the company's existing program that reduced the cost of maintaining the RB211 engine powering Iberia's Boeing 757 freighters. Key to these programs is the salvaging, repair and reuse of serviceable parts from retired older engines. Airbus could offer used A340s to airlines wishing to retire older aircraft such as the Boeing 747-400, claiming that the cost of purchasing and maintaining a second-hand A340 with increased seating and improved engine performance reportedly compared favourably to the procurement costs of a new Boeing 777. The Airbus A340 is a widebody twin-aisle passenger airliner which, along with its sibling the A330, has the distinction of being the first truly long-range aircraft to be produced by Airbus. It is powered by four FADEC turbofan jet engines, optimized to perform long distance routes. The A340 had built upon developments made in the production of earlier Airbus aircraft and as such shares many features with those aircraft, such as a common cockpit design with the Airbus A320 and A330; as the aircraft was developed at the same time as the A330 the two aircraft employ many similar components and sections, such as identical fly-by-wire control systems and similar wings. Both before and after the A340 entered revenue service, the features and improvements that were developed for the type were usually shared with the A330, a significant beneficial factor in performing such programs. The A340 is a low-wing cantilever monoplane; the wing itself is virtually identical to that of the A330. The wings were designed and manufactured by BAe, which developed a long slender wing with a very high aspect ratio to provide high aerodynamic efficiency. [lower-alpha 1] The wing is swept back at 30 degrees and, along with other design features, allows a maximum operating Mach number of 0.86. The wing has a very high thickness-to-chord ratio of 12.8 per cent, which means that a long span and high aspect ratio can be attained without a severe weight penalty. For comparison, the rival MD-11 has a thickness-to-chord ratio of 8–9 per cent. Each wing also has a 2.74 m (9.0 ft) tall winglet instead of the wingtip fences found on earlier Airbus aircraft. The failure of International Aero Engines' radical ultra-high-bypass V2500 "SuperFan", which had promised around 15 per cent fuel burn reduction for the A340, led to multiple enhancements including wing upgrades to compensate. Originally designed with a 56 m (184 ft) span, the wing was later extended to 58.6 m (192 ft) and finally to 60.3 m (198 ft). At 60.3 m (198 ft), the wingspan is similar to that of the larger Boeing 747-200, but with 35 percent less wing area. The flight deck of the A340 is a glass cockpit, based upon the control systems first used on the smaller A320. Instead of a conventional control yoke, the flight deck features side-stick controls. The main instrument panel is dominated by a total of six cathode ray tube monitors which display information to the flight crew; on later aircraft these monitors have been replaced by liquid crystal displays. Flight information is directed via the Electronic Flight Instrument System (EFIS) and systems information through the Electronic Centralised Aircraft Monitor (ECAM). The aircraft monitoring system is connected to various sensors throughout the aircraft and automatically alerts the crew to any parameters detected outside of their normal range; pilots can also manually inspect systems of their choosing at any time. The information display system is designed to be easily interpreted and give a clear picture of the aircraft's operational status. Instead of paper manuals, electronic CD-ROM-based manuals are used; Airbus offers web-based updates to electronic documentation as an option. Many measures were taken from the start of the A340's design process to reduce the difficulty and cost of maintenance, which was reportedly half of that of the earlier Airbus A310 despite the increase in size. The aircraft's four engines featured improved controls and monitoring systems that enabled engine parameters to be more readily checked and avoid unnecessary early removals; the four-engine approach also avoided the stringent ETOPS requirements such as more frequent inspections. The A340 also has a centralised maintenance computer which provides comprehensive easily understandable systems information, which can be transmitted in real-time to ground facilities via the onboard satellite-based ACARS datalink. Some aspects of the maintenance, such as structural changes, remained unchanged, while increased sophistication of technology in the passenger cabin, like the in-flight entertainment systems, were increased over preceding airliners. The first variant of the A340 to be introduced, the A340-200, entered service with the launch customer, Lufthansa, in 1993. It was followed shortly thereafter by the A340-300 with its operator, Air France. Lufthansa's first A340, which had been dubbed Nürnberg (D-AIBA), began revenue service on 15 March 1993. Air Lanka (later renamed Sri Lankan Airlines) became the Asian launch customer of the Airbus A340; the airline received its first A340-300, registered (4R-ADA), in September 1994. British airline Virgin Atlantic was an early adopter of the A340; in addition to operating several A340-300 aircraft, Virgin Atlantic announced in August 1997 that it was to be the worldwide launch customer for the new A340-600. The first commercial flight of the A340-600 was performed by Virgin in July 2002. Singapore Airlines ordered 17 A340-300s and operated them until October 2013. The A340-300s were purchased by Boeing as part of an order for Boeing 777s in 1999. The airline then purchased five long-range A340-500s, which joined the fleet in December 2003. In February 2004, the airline's A340-500 performed the longest non-stop commercial air service in the world, conducting a non-stop flight between Singapore and Los Angeles. In 2007, Singapore Airlines launched an even longer non-stop route using the A340-500 between Newark and Singapore, SQ 21, a 15,344 kilometres (8,285 nmi) journey that was the longest scheduled non-stop commercial flight in the world. The airline continued to operate this route regularly until the airline decided to retire the type in favour of new A380 and A350 aircraft; its last A340 flight was performed in late 2013. The A340 was typically used by airlines as a medium-sized long-haul aircraft, and was often a replacement for older Boeing 747s as it was more likely profitable. Airbus produced a number of A340s as large private jets for VIP customers, often to replace aging Boeing 747s in this same role. In 2008, Airbus launched a dedicated corporate jetliner version of the A340-200: one key selling point of this aircraft was a range of up to 8,000 nautical miles (15,000 km). Airbus had built up to nine different customized versions of the A340 to private customer's specific demands prior to 2008. The A340 has frequently been operated as a dedicated transport for heads of state. A pair of A340-300s were acquired from Lufthansa by the Flugbereitschaft of the German Air Force; they serve as VIP transports for the German Chancellor and other key members of the German government. The A340 is also operated by the air transport division of the French Air Force, where it is used as a strategic transport for troop deployments and supply missions, as well as to transport government officials. A one-of-a-kind aircraft, the A340-8000, was originally built for Prince Jefri Bolkiah, brother of the Sultan of Brunei Hassanal Bolkiah. The aircraft was unused and stored in Hamburg until it was procured by Prince Al-Waleed bin Talal of the House of Saud, and later sold to Colonel Muammar Gaddafi, then-President of Libya; the aircraft was operated by Afriqiyah Airways and was often referred to as Afriqiyah One. In 2008, jet fuel prices doubled compared to the year before; consequently, the A340's fuel consumption led airlines to reduce flight stages exceeding 15 hours. Thai Airways International cancelled its 17-hour, nonstop Bangkok–New York/JFK route on 1 July 2008, and placed its four A340-500s for sale. While short flights stress aircraft more than long flights and result in more frequent fuel-thirsty take-offs and landings, ultra-long flights require completely full fuel tanks. The higher weights in turn require a greater proportion of an aircraft's fuel fraction just to take off and to stay airborne. In 2008, Air France-KLM SA's chief executive Pierre-Henri Gourgeon disparagingly referred to the A340 as a "flying tanker with a few people on board". While Thai Airways consistently filled 80% of the seats on its New York City–Bangkok flights, it estimated that, at 2008 fuel prices, it would need an impossible 120% of seats filled just to break even. Other airlines also re-examined long-haul flights. In August 2008 Cathay Pacific stated that rising fuel costs were hurting its trans-Pacific long-haul routes disproportionately, and that it would cut the number of such flights and redeploy its aircraft to shorter routes such as between Hong Kong and Australia. "We will ... reshap[e] our network where necessary to ensure we fly aircraft to where we can cover our costs and also make some money." Aviation Week noted that rapid performance increases of twin-engine aircraft has led to the detriment of four-engine types of comparable capacity such as the A340 and 747; at this point most 747s had accumulated significant flying hours before retirement in contrast to A340s which were relatively young when grounded. By 2014, Singapore Airlines had phased out the type, discontinuing SQ21 and SQ22, which had been the longest non-stop scheduled flights in the world. Emirates Airlines decided to accelerate the retirement of its A340 fleet, writing down the value of the A340-500 type to zero despite the oldest -500 only being 10 years old, with president Tim Clark saying they "designed in the late 1990s with fuel at $25-30. They fell over at $60 and at $120 they haven’t got a hope in hell". International Airlines Group, the parent of Iberia Airlines (which is also the operator of the last production A340 built), is overhauling its A340-600s for continued service for the foreseeable future, while it is retiring its A340-300s. The IAG overhaul featured improved conditions and furnishings in the business and economy classes; the business-class capacity was raised slightly while not changing the type's overall operating cost. Lufthansa, which operates both Airbus A340-300s and -600s, concluded that, while it is not possible to make the A340 more fuel efficient, it can respond to increased interest in business-class services by replacing first-class seats with more business-class seats to increase revenue. In 2013, Snecma announced that they planned to use the A340 as a flying testbed for the development of a new open rotor engine. This test aircraft is forecast to conduct its first flight in 2019. Open rotor engines are typically more fuel-efficient but noisier than conventional turbofan engines; introducing such an engine commercially has been reported as requiring significant legislative changes within engine approval authorities due to its differences from contemporary jet engines. The engine, partly based on the Snecma M88 turbofan engine used on the Dassault Rafale, is being developed under the European Clean Sky research initiative. There are four variants of the A340. The A340-200 and A340-300 were launched in 1987 with introduction into service in March 1993 for the -200. The A340-500 and A340-600 were launched in 1997 with introduction into service in 2002. All variants were available in a corporate version. The -200 is one of two initial versions of the A340; it has seating for 261 passengers in a three-class cabin layout with a range of 13,800 kilometres (7,500 nmi) or seating for 240 passengers also in a three-class cabin layout for a range of 15,000 kilometres (8,100 nmi). This is the shortest version of the family and the only version with a wingspan measuring greater than its fuselage length. It is powered by four CFMI CFM56-5C4 engines and uses the Honeywell 331–350[A] auxiliary power unit (APU). It initially entered service with Air France in May 1993. Due to its large wingspan, four engines, low capacity and improvements to the larger A340-300, the -200 proved heavy and unpopular with mainstream airlines. Only 28 A340-200s were produced. The closest Boeing competitor is the Boeing 767-400ER. One version of this type (referred to by Airbus as the A340-8000) was ordered by the prince Jefri Bolkiah requesting a non-stop range of 15,000 kilometres (8,100 nmi). This A340-8000, in the Royal Brunei Airlines livery had an increased fuel capacity, an MTOW of 275 tonnes (606,000 lb), similar to the A340-300, and minor reinforcements to the undercarriage. It is powered by the 150 kilonewtons (34,000 lbf) thrust CFM56-5C4s similar to the -300E. Only one A340-8000 was produced. Besides the -8000, some A340-200s are used for VIP or military use; users include Royal Brunei Airlines, Qatar Amiri Flight, Arab Republic of Egypt Government, Royal Saudi Air Force, Jordan and the French Air Force. Following the -8000, other A340-200s were later given performance improvement packages (PIPs) that helped them achieve similar gains in capability as to the A340-8000. Those aircraft are labeled A340-213X. The range for this version is 15,000 kilometres (8,100 nmi). As of April 2016, there are 11 Airbus A340-200s in service, of which 6 are used in government fleets. The A340-300 flies 295 passengers in a typical three-class cabin layout over 6,700 nautical miles (12,400 km). This is the initial version, having flown on 25 October 1991, and entered service with Lufthansa and Air France in March 1993. It is powered by four CFMI CFM56-5C engines and uses the Honeywell 331–350[A] APU, similar to the -200. The A340-300 will be superseded by the A350-900. Its closest competitor is the Boeing 777-200ER. A total of 218 -300s were delivered. The A340-300E, often mislabelled as A340-300X, has an increased MTOW of up to 275 tonnes (606,000 lb) and is powered by the more powerful 34,000 lbf (150 kN) thrust CFMI CFM56-5C4 engines. Typical range with 295 passengers is between 7,200 to 7,400 nautical miles (13,300 to 13,700 km). The largest operator of this type is Lufthansa, who has operated a fleet of 30 aircraft. The A340-300 Enhanced is the latest version of this model and was first delivered to South African Airways in 2003, with Air Mauritius receiving the A340-300 Enhanced into its fleet in 2006. It received newer CFM56-5C4/P engines and improved avionics and fly-by-wire systems developed for the A340-500 and -600. As of April 2016, there were 135 Airbus A340-300s in service. The A340-500 was introduced as the world's longest-range commercial airliner. It first flew on 11 February 2002, and was certified on 3 December 2002. Air Canada was supposed to be the launch customer, but filed for bankruptcy in January 2003, delaying delivery to March. This allowed early deliveries to the new launch customer, Emirates, allowing the carrier to launch nonstop service from Dubai to New York—its first route in the Americas. The A340-500 can fly 313 passengers in a three-class cabin layout over 16020 km (8650 nm). Compared with the A340-300, the -500 features a 4.3-metre (14.1 ft) fuselage stretch, an enlarged wing, significant increase in fuel capacity (around 50% over the -300), slightly higher cruising speed, a larger horizontal stabilizer and a larger vertical tailplane. The centerline main landing gear was changed to a four-wheel bogie to support additional weight. The A340-500 is powered by four 240 kN (54,000 lbf) thrust Rolls-Royce Trent 553 turbofans and uses the Honeywell 331–600[A] APU. It was the world's longest-range commercial airliner until the introduction of its direct rival, Boeing 777-200LR, in February 2006. Due to its range, the -500 is capable of travelling non-stop from London to Perth, Western Australia, though a return flight requires a fuel stop due to headwinds. Singapore Airlines used this model (initially in a two-class, 181-passenger layout, later in a 100-passenger business-only layout) for its Newark–Singapore nonstop route, SQ 21: an 18-hour, 45-minute "westbound" (really northbound to 130 km (70 nm) abeam the North Pole; then south from there across Russia, Mongolia and People's Republic of China), 18-hour, 30-minute eastbound, 15,344 kilometres (8,285 nmi) journey that was the longest scheduled non-stop commercial flight in the world, this flight route ceased operation in 2013. The Singapore Airlines -500 is the first aircraft to include a corpse cupboard, used for storing the body of a passenger who dies during a flight. The A340-500IGW (Increased Gross Weight) version has a range of 17,000 km (9,200 nmi) and a MTOW of 380 t (840,000 lb) and first flew on 13 October 2006. It uses the strengthened structure and enlarged fuel capacity of the A340-600. The certification aircraft, a de-rated A340-541 model, became the first delivery, to Thai Airways International, on 11 April 2007. Nigerian airline Arik Air received a pair of A340-542s in November 2008, using the type to immediately launch two new routes, Lagos–London Heathrow and Lagos–Johannesburg; a non-stop Lagos–New York route began in January 2010. The A340-500IGW is powered by four 250 kN (56,000 lbf) thrust Rolls-Royce Trent 556 turbofans. In April 2016, there were 11 A340-500s in service. Designed to replace early-generation Boeing 747 airliners, the A340-600 is capable of carrying 379 passengers in a three-class cabin layout 13,900 km (7,500 nmi). It provides similar passenger capacity to a 747 but with 25 percent more cargo volume, and at lower trip and seat costs. First flight of the A340-600 was made on 23 April 2001. Virgin Atlantic began commercial services in August 2002. The variant's main competitor is the 777-300ER. The A340-600 will eventually be replaced by the A350-1000. The A340-600 is 12 m (39 ft 4.4 in) longer than a -300, more than 4 m (13 ft 1.5 in) longer than the Boeing 747-400 and 2.3 m (7 ft 6.6 in) longer than the A380. It held the record as the world's longest commercial aircraft until February 2010 with the first flight of the Boeing 747-8. The A340-600 is powered by four 250 kN (56,000 lbf) thrust Rolls-Royce Trent 556 turbofans and uses the Honeywell 331–600[A] APU. As with the -500, it has a four-wheel undercarriage bogie on the fuselage centre-line to cope with the increased MTOW along with the enlarged wing and rear empennage. Upper deck main cabin space can be optionally increased by locating facilities such as crew rest areas, galleys, and lavatories upon the aircraft's lower deck. In early 2007, Airbus reportedly advised carriers to reduce cargo in the forward section by 5.0 t (11,000 lb) to compensate for overweight first and business class sections; the additional weight caused the aircraft's centre of gravity to move forward thus reducing cruise efficiency. Affected airlines considered filing compensation claims with Airbus. The A340-600HGW (High Gross Weight) version first flew on 18 November 2005 and was certified on 14 April 2006. It has an MTOW of 380 t (840,000 lb) and a range of up to 14,630 km (7,900 nmi), made possible by strengthened structure, increased fuel capacity, more powerful engines and new manufacturing techniques like laser beam welding. The A340-600HGW is powered by four 61,900 lbf (275 kN) thrust Rolls-Royce Trent 560 turbofans. Emirates became the launch customer for the -600HGW when it ordered 18 at the 2003 Paris Air Show; but postponed its order indefinitely and later cancelled. Rival Qatar Airways, which placed its order at the same airshow, took delivery of only four aircraft with the first aircraft on 11 September 2006. The airline has since let its purchase options expire in favour of orders for the Boeing 777-300ER. In July 2015, seven airlines worldwide operated A340-600s. In April 2016, there were 77 A340-600s in service. A total of 227 aircraft (all A340 variants) were in airline service in July 2015 with operators Lufthansa (41), Iberia (24), South African Airways (17), Swiss International Air Lines (15), Air France (13), Virgin Atlantic (11), Etihad Airways (11), Cathay Pacific (8), Scandinavian Airlines (8), and other airlines with fewer aircraft of the type. Data through end of September 2015. Updated on 9 October 2015. 20 January 1994 – an Air France A340-200 registered F-GNIA was burnt out after a fire started during servicing at Paris Charles de Gaulle Airport. 24 July 2001 – an A340-300 of SriLankan Airlines was destroyed on the ground at Bandaranaike International Airport; being one of 26 aircraft which were damaged or destroyed during a major attack upon the airport by Liberation Tigers of Tamil Eelam militants. 2 August 2005 – Air France Flight 358, a crash and fire after A340-300 F-GLZQ overran runway 24L at Toronto Pearson International Airport while landing in a thunderstorm. The aircraft slid into Etobicoke Creek and caught fire. All 297 passengers and 12 crew survived; 43 people were injured, 12 serious. 9 November 2007 – an Iberia Airlines A340-600 was badly damaged after sliding off the runway at Ecuador's Mariscal Sucre International Airport. The landing gear collapsed and two engines broke off. All 333 passengers and crew were evacuated via inflatable slides, and there were no serious injuries. The aircraft was scrapped. 15 November 2007 – an A340-600 was damaged beyond repair during ground testing at Airbus' facilities at Toulouse Blagnac International Airport. During a pre-delivery engine test, multiple safety checks had been disabled, leading to the non-chocked aircraft accelerating to 31 knots (57 km/h) and colliding with a concrete blast deflection wall. The right wing, tail, and left engines made contact with the ground or wall, leaving the forward section elevated several metres and the cockpit broken off; nine people on board were injured, four of them seriously. The aircraft was written off and was later used at Virgin Atlantic's cabin crew training facility in Crawley. It was due to be delivered to Etihad Airways. 20 March 2009 – Emirates Flight 407 was an Emirates flight flying from Melbourne to Dubai-International using an A340-500. The flight failed to take off properly from Melbourne Airport, hitting several structures at the end of the runway before eventually climbing enough to return to the airport for a safe landing. The occurrence was severe enough to be classified an accident by the Australian Transport Safety Bureau. The plane was subsequently repaired, and returned to service for five years before it was scrapped. ↑ The higher the aspect ratio, the greater the aerodynamic efficiency. 1 2 "Completion of production marks new chapter in the A340 success story". Airbus. 1 2 "Airbus orders and deliveries". Airbus S.A.S. 30 September 2015. Retrieved 9 October 2015. 1 2 3 "Airbus aircraft 2011 average list prices" (PDF). Airbus S.A.S. Retrieved 1 February 2011. ↑ "Dimensions & key data | Airbus, a leading aircraft manufacturer". Retrieved 2016-07-06. ↑ "Aircraft Family – (A330-200) Specifications". Airbus. Archived from the original on 4 March 2008. 1 2 Broderick, Sean. "A340 Operators Spend On Interiors, Engines." Archived 14 May 2016 at the Wayback Machine. Aviation Week, 23 September 2013. "...Technology, particularly in twinjet airframe and engine design, simply got better. And it doomed almost all quad jets—and certainly those battling twins of comparable capacity—in the process." ↑ Maynard, Micheline (11 June 2008). "To Save Fuel, Airlines Find No Speck Too Small". The New York Times. ↑ "Commercial Aircraft of the World part 2". Flight International. 17 October 1981. Retrieved 23 January 2011. ↑ Kingsley-Jones, Max (4 November 1997). "Airbus A330/A340". Flight International. Retrieved 26 January 2011. ↑ "Timeline 40 Years of Innovation" (PDF). Airbus. Archived (PDF) from the original on 27 May 2011. Retrieved 8 June 2011. ↑ "Flight-distance record awaits as big 777 heads to London". seattlepi.com. Retrieved 1 April 2015. ↑ "Aviation Today :: A340-300 & B777-200ER Current & Residual Values 'On Watch' Status". 1 2 "Airbus, engine OEMs make the case for A340 future - Leeham News and Comment". 9 December 2013. ↑ Doyle, Andrew. "Airbus suffers setback as GE walks away from A340-600." Archived 27 August 2016 at the Wayback Machine. Flight International, 25 February 1997. 1 2 3 "EXCLUSIVE: Enhanced A340 to take on 777." Archived 30 September 2007 at the Wayback Machine. Flight International, 29 November 2005. 1 2 Flottau, Jens. "Airbus Bids Adieu to A340, Postpones A350 Delivery." Archived 14 May 2016 at the Wayback Machine. Aviation Week & Space Technology, 14 November 2011. 1 2 Rothman, Andrea. "Airbus's Longest Plane Proves Short-Lived as A340 Orders Dry Up". Bloomberg. Retrieved 1 April 2015. ↑ Aviation Week & Space Technology, 29 October 2007, p. 63. ↑ "Airbus Delays A350-900, Terminates A340." Archived 21 January 2016 at the Wayback Machine. Aviation Week, 10 November 2011. "The company also announced that it is terminating the A340 program, which has not seen any sales recently. All of the 246 Airbus A340-200s and -300s are delivered. Airbus lists 133 orders and 129 deliveries for the A340-500/600 program." ↑ Compart, Andrew. "Young at Part". Aviation Week and Space Technology, 15 April 2013. pp. 44-46. ↑ "Weight in waiting." Aviation Week and Space Technology, 14 April 2014. pp. 54-55. ↑ "Haunted by old pledges, Airbus aims to boost A340 value". Reuters. 5 December 2013. Retrieved 15 December 2013. 1 2 3 4 de Montalk, J.P. Potocki. "New Avionics Systems — Airbus A330/A340." Archived 31 March 2016 at the Wayback Machine. CRC Press LLC, 2001. ↑ "Wing Geometry Definitions". NASA. Retrieved 17 March 2011. A higher aspect ratio wing has a lower drag and a slightly higher lift than a lower aspect ratio wing. 1 2 Norris & Wagner 2001, p. 50. 1 2 "A330-300 Dimensions & key data". Airbus S.A.S. Retrieved 20 November 2012. 1 2 Gunston 2009, p. 195. 1 2 3 Norris & Wagner 2001, p. 31. ↑ "Airbus A330 Wide-Bodied Medium/Long-Range Twin-Engine Airliner, Europe". Aerospace-technology.com. Retrieved 31 January 2011. ↑ "A330 Flight deck and systems briefing for pilots" (PDF). Airbus S.A.S. March 1999. p. 173. Retrieved 31 January 2011. 1 2 3 4 Dubois, Thierry. "Airbus A340: Smart Design." Archived 13 August 2016 at the Wayback Machine. Aviation Today, 1 June 2003. 1 2 "A brief history of Virgin Atlantic." Archived 3 March 2016 at the Wayback Machine. Virgin Atlantic, Retrieved: 11 May 2014. ↑ Zuckerman, Laurence (1 July 1999). "Boeing and Airbus Battle Over Singapore Airline Sales". New York Times. Retrieved 19 July 2016. ↑ "Singapore Airlines A340-500 Flies Into The Record Books". Archived 22 June 2016 at the Wayback Machine. Airbus S.A.S, 4 February 2004. 1 2 "Singapore Air makes longest flight". CNN. Archived from the original on 25 December 2007. ↑ Peterson, Barbara. "Singapore Airlines to End World's Longest Flight." Archived 12 May 2014 at the Wayback Machine. The Daily Traveler, 24 October 2012. ↑ Lombardo, David A. "Airbus unveils A340-200 bizliner." Archived 14 May 2016 at the Wayback Machine. Aviation International News, 27 May 2008. ↑ "Bundeswehr will im Eiltempo neue Regierungsflugzeuge anschaffen". Der Spiegel. 7 March 2008. Retrieved 12 March 2008. ↑ Osborne, Tony. "French Air Force A400M Breaks Cover." Archived 14 May 2016 at the Wayback Machine. Aviation Week, 17 January 2013. ↑ "Picture: Former Sultan of Brunei's unique A340-8000 derivative destined for Saudi Arabian VIP after nine years storage." Archived 14 May 2016 at the Wayback Machine. Flight International, 7 March 2007. ↑ Whyte, Alasdair. "Selling a VIP business jet to Colonel Gaddafi." Archived 16 April 2016 at the Wayback Machine. corporatejetinvestor.com, 16 August 2013. ↑ Michaels, Daniel. "Airlines Cut Long Flights To Save Fuel Costs." Archived 28 December 2011 at the Wayback Machine. Wall Street Journal, 8 July 2008. ↑ Airlines curb Long Flights to Save on Fuel, Wall Street Journal, 8 July 2008, pp. B1-B2. ↑ Carol Matlack. "Airbus's A340 Resale Value Guarantee Could Cost Billions - Businessweek". Businessweek.com. Retrieved 1 April 2015. 1 2 Kingsley-Jones, Max. "Emirates begins parting out its A340-500s". Flightglobal. Retrieved 19 July 2016. ↑ Haria, Rupa. "Weight in Waiting." Aviation Week and Space Technology, 14 April 2014. pp. 54-55. ↑ Gubisch, Michael. "Snecma to flight-test open rotor on A340 in 2019." Archived 14 May 2016 at the Wayback Machine. Flight International, 2 January 2014. ↑ Warwick, Graham. "Snecma Prepares For Crucial Open-rotor Tests." Archived 14 May 2016 at the Wayback Machine. Aviation Week, 19 June 2013. ↑ "ICAO Document 8643". International Civil Aviation Organization. Retrieved 9 February 2011. ↑ "A330/A340 family: Twin-and four-engine efficiency". Airbus. Archived from the original on 19 November 2010. Retrieved 1 November 2010. 1 2 "Product Catalog". Honeywell. Archived from the original on 12 July 2011. Retrieved 18 November 2010. ↑ "The Market for Large Commercial Jet Transports 2011–2020" Archived 29 September 2011 at the Wayback Machine.. Forecast International, July 2011. ↑ "Boeing: 777 way much better than A330". 8 December 2010. ↑ Clark, Andrew (29 June 2004). "Record longest flight flies in the face of its critics". The Guardian. UK. Retrieved 3 February 2010. ↑ Andrew Clark (11 May 2004). "Airline's new fleet includes a cupboard for corpses". The Guardian. Retrieved 11 May 2012. ↑ "Kingfisher grows its Airbus fleet with purchase of five A340-500" (Press release). Airbus. 24 April 2006. Archived from the original on 3 December 2010. Retrieved 10 November 2010. ↑ "VIRGIN ATLANTIC'S A340-600 – THE LONGEST PLANE IN THE WORLD – TAKES ITS FIRST COMMERCIAL FLIGHT". Asiatraveltips.com. 1 August 2002. Retrieved 3 December 2010. ↑ "Virgin Atlantic's A340-600 – the Longest Plane in the World – Takes its First Commercial Flight". Pressreleasenetwork.com. 5 August 2002. Archived from the original on 27 November 2010. Retrieved 3 December 2010. ↑ Robertson, David (7 April 2007). "Carriers ponder compensation claims against Airbus for overweight aircraft". The Times. London. Archived from the original on 8 April 2007. Retrieved 7 April 2007. ↑ "New A340-600 takes to the skies". 18 November 2005. Archived from the original on 19 May 2006. Retrieved 6 August 2006. ↑ "Newly certified A340-600 brings 18% higher productivity". 14 April 2006. Archived from the original on 16 June 2006. Retrieved 6 August 2006. ↑ "Emirates orders 41 additional Airbus aircraft". 16 June 2003. Archived from the original on 19 May 2006. Retrieved 6 August 2006. ↑ Wallace, James; Aerospace, P-I (29 November 2007). "First Boeing jet of many touches down in Qatar". Seattle Post-Intelligencer. Retrieved 2 July 2011. 1 2 "World Airliner Census" (PDF). Flight International. July 2015. p. 14. Retrieved September 27, 2015. ↑ planespotters.net - Airbus A340-600 Production List Archived 10 October 2016 at the Wayback Machine. retrieved 27 April 2016. ↑ "Airbus A340 Hull Losses". aviation-safety.net. Flight Safety Foundation. Retrieved 10 April 2014. ↑ Accident description for Airbus A340-211 F-GNIA at the Aviation Safety Network. Retrieved on 10 April 2014. ↑ Accident description for Airbus A340-312 4R-ADD at the Aviation Safety Network. Retrieved on 10 April 2014. ↑ "Intelligence failures exposed by Tamil Tiger airport attack". Jane's Intelligence Review. 2001. Archived from the original on 25 February 2008. ↑ Accident description for Airbus A340-313X F-GLZQ at the Aviation Safety Network. Retrieved on 10 April 2014. ↑ "TSB advises runway changes in light of Air France crash." Archived 13 December 2007 at the Wayback Machine. CBC News, 12 December 2007. ↑ Accident description for Airbus A340-642 EC-JOH at the Aviation Safety Network. Retrieved on 10 April 2014. 1 2 "Accident survenu le 15 novembre 2007 sur l'aérodrome de Toulouse Blagnac à l'Airbus A340-600 numéro de série 856" (PDF) (in French). BEA (Bureau d'Enquêtes et d'Analyses pour la Sécurité de l'Aviation Civile). Archived (PDF) from the original on 16 November 2009. Retrieved 4 November 2009. ↑ Kaminski-Morrow, David (10 December 2008). "Violation of test procedures led to Toulouse A340-600 crash". Flightglobal. Reed Business Information. Archived from the original on 4 January 2013. ↑ "Toulouse accident occurred as Airbus A340 was exiting engine test-pen". Flight International.com. Archived from the original on 11 December 2008. Retrieved 17 November 2008. ↑ Stewart, Cameron (12 September 2009). "The devil is in the data". The Australian. Retrieved 26 January 2011. 1 2 3 4 5 "Aircraft Characteristics Airport Planning - A340-200/300" (PDF). Airbus. January 2016. 1 2 3 4 5 "Aircraft Characteristics Airport Planning - A340-500/600" (PDF). Airbus. January 2016. 1 2 3 "Type Certificate Data Sheet A.015 AIRBUS A340 Issue 20" (PDF). European Aviation Safety Agency. 21 October 2010. Retrieved 28 January 2011. 1 2 3 4 "Airbus Aircraft Data File". Civil Jet Aircraft Design. Elsevier. July 1999. 1 2 "A340-200/300". Aircraft Technical Data & Specifications. Airliners.net. 1 2 "A340-500/600". Aircraft Technical Data & Specifications. Airliners.net. ↑ "Airbus A340-300" (PDF). Lufthansa. August 2010. ↑ "Airbus A340-600" (PDF). Lufthansa. August 2010. Bolorj. Airbus Civilian Jets: A Complete Guide. Wikimedia Commons has media related to Airbus A340.